Inquire about our FREE taster days at info@inspiring-potential.co.uk! Course Fee: £1,950 + VAT (£2,340.00) It includes all material, lunch and refreshments. NLP can bring many benefits to all aspects of your life, from personal relationships, achieving health and fitness goals and improving business success. But sometimes this wide application can be problem for people wanting to specifically target work-related issues. Inspiring Potential now brings you the possibility of applying powerful NLP learnings in the context of your working life through our NLP business courses in London. 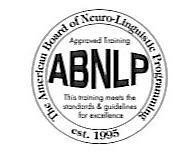 Our NLP Business Practitioner Training is fully accredited by the American Board of NLP (ABNLP). Participants who complete the programme will obtain certification from this governing body. Some people call it the manual of the brain. NLP helps people to understand their mind, how it works, and how it affects their behaviour. It is a way of thinking based on curiosity, exploration, flexibility and fun. It has great benefits in business and personal development. NLP provides us with the tools and techniques to model human excellence in the areas of communicating, influencing, goal setting, managing change and understanding the use of effective language. NLP helps you get the results you want. "NLP has given me the opportunity to understand myself and others around me. It has been the best time of my life. Noel and Marielena complement each other extremely well, are great communicators and make a great team"
"I would absolutely recommend the NLP course, it gave me excellent value personally and professionally. It has given me additional tools in my tool kit for coaching and work. It was an incredible journey"
"Not only does Inspiring Potential equip you with a toolkit to let you better understand yourself and communicate far better with other people, but also the course is delivered over a period to allow you to soak up the learnings and practice them in a matter that is supportive, safe, encouraging and delightful. You will be transformed"
"I am much more aware of my stuff which has been helped me separate it from their stuff in my client sessions. It was great"
We send you a multimedia pack before you come on the course which you listen to as preparation for the course. By listening to the CDs in your own time you manage how quickly or slowly you learn but normally the pre-course study will take you about 20 hours. We have split the course over 5 months, so you can build a support network of like-minded people. Also the fact that it is over longer period of time gives you time to incorporate NLP into your personal growth and experience. The course is very experiential and you will leave confident in your abilities. It will help you create the changes in your work and personal life that you desire. In addition to being Certified as a Neuro-Linguistic Practitioner in a training certified and approved by the ABNLP you will also study subjects above and beyond the minimum standards laid down by the ABNLP for a Practitioner Training. For more information and to obtain a colour brochure on our NLP Training Courses London, or if you would like to enrol on the course, please call us on: 0845 355 1159. Alternatively click here to download an application form for one of our NLP business courses.